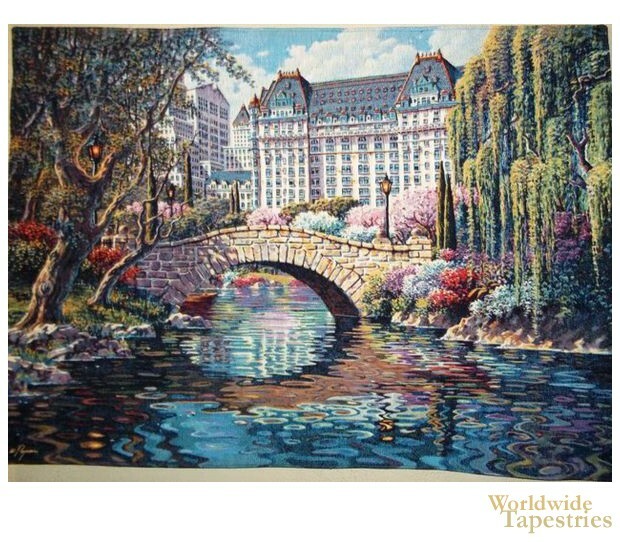 Plaza tapestry shows a city side river, bridge and gardens. Filled with gorgeous color, this piece shows the city gardens and river accentuated by the cobblestoned style bridge. The details in the trees and foliage are beautiful as is the reflection in the water. This "Plaza" tapestry is backed with a lining and has a tunnel for easy hanging. Dimensions: W 53" x H 39"